For other uses, see Brass knuckles (disambiguation). "Knuckleduster" redirects here. For the flying boat, see Short Knuckleduster. Brass knuckles, also sometimes called knuckles, knucks, brass knucks, knucklebusters, knuckledusters, an English punch or a classic, are weapons used in hand-to-hand combat. Brass knuckles are pieces of metal shaped to fit around the knuckles. Despite their name, they are often made from other metals, plastics or carbon fibers. Designed to preserve and concentrate a punch's force by directing it toward a harder and smaller contact area, they result in increased tissue disruption, including an increased likelihood of fracturing the victim's bones on impact. The extended and rounded palm grip also spreads across the attacker's palm the counter-force that would otherwise be absorbed primarily by the attacker's fingers, reducing the likelihood of damage to the attacker's fingers. Metal ring and knuckle style weapons date back to ancient times and have been used all over the world for many hundreds of years. The Nihang Sikhs used an early variant called Sher Panja in the 18th century. Cast iron, brass, lead, and wood knuckles were made in the United States during the American Civil War (1861–1865). Soldiers would often buy cast iron or brass knuckles. If they could not buy them, they would carve their own from wood, or cast them at camp by melting lead bullets and using a mold in the dirt. Some brass knuckles have rounded rings, which increase the impact of blows from moderate to severe damage. Other instruments (not generally considered to be "brass knuckles" or "metal knuckles" per se) may have spikes, sharp points and cutting edges. These devices come in many variations and are called by a variety of names, including "knuckle knives." By the late 19th century, knuckledusters were incorporated into various kinds of pistols such as the Apache revolver used by criminals in France in the late 19th to early 20th centuries. During World War I the US Army issued two different knuckle knives, the US model 1917 and US model 1918 Mark I trench knives. Knuckles and knuckle knives were also being made in England at the time and purchased privately by British soldiers. By World War II, knuckles and knuckle knives were quite popular with both American and British soldiers. The Model 1918 trench knives were reissued to American paratroopers. British Commandos even had their very own "Death's Head" knuckle knife, featuring a skull-shaped brass knuckle handle. A notable knuckle knife still in use is the Cuchillo de Paracaidista, issued to Argentinian paratroopers. Current-issue models have an emergency blade in the crossguard. Brass knuckles are illegal in Hong Kong, Austria, Belgium, Canada, Bosnia, Croatia, Cyprus, Finland, Germany, Greece, Hungary, Israel, the Republic of Ireland, Malaysia, the Netherlands, Norway, Poland, Portugal, Russia ("кастет", from French "casse-tête", which means "head-breaker"), Spain, Turkey, Singapore, Taiwan,  and the United Kingdom. Import of knuckle dusters into Australia is illegal unless a government permit is obtained; permits are only available for limited purposes, such as police and government use, or use in film productions. They are prohibited weapons in the state of New South Wales. In Brazil, brass knuckles are legal and freely sold. They are called "Soco Inglês," which means "English Punch." 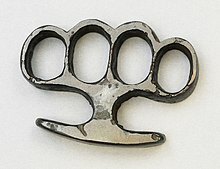 In Canada, brass knuckles, or any similar devices, are listed as prohibited weapons; possession of such weapon is a criminal offence under the Criminal Code. Plastic knuckles have been determined to be legal in Canada. Similar legislation has been instituted in Russia and Australia. In France, brass knuckles have been illegal for twenty years. They can be bought as a "collectable" (provided one is over 18), but it is forbidden to carry or use one, whatever the circumstance, self-defense included. The French term is "poing américain", which literally means "American fist". In Italy and Mexico, brass knuckles are legal and freely sold to people of legal age (over 18 years old), but carrying them is forbidden. In Sweden, brass knuckles are legal to purchase and own (for people over 18 years old), but are not legal to sell or carry in public. The carrying of brass knuckles carry the same penalty as carrying a knife, and falls under the same law. They are called "knogjärn", literally "knuckle iron". In Serbia, knuckles are legal to purchase and own (for people over 16 years old) but are not legal to carry in public. They are called "боксер" literally "boxer". In the United States, brass knuckles are not significantly regulated at the federal level, but various state, county and city laws prohibit their purchase and/or possession. Some state laws require purchasers to be 18 or older. Most states have statutes regulating the carrying of weapons, and many specifically prohibit brass knuckles or "metal knuckles." Where they are legal, brass knuckles can normally be purchased online or at flea markets, swap meets, and at some sword and weapon shops. Some companies manufacture belt buckles or novelty paper weights that function as brass knuckles and are sold "for entertainment purposes only". Brass knuckles made of hardened plastic, rather than metal, have been marketed as "undetectable by airport metal detectors." A number of states that ban brass knuckles also ban plastic knuckles. New York's criminal law statutes list both "metal knuckles" and "plastic knuckles" as prohibited weapons but provide no definition for either. Wikimedia Commons has media related to Brass knuckles. ^ "0-Blades & Barrels". www.horstheld.com. ^ "Zabranjeno oružje - idealan dar: kupite bokser za samo 350 kuna". Novi list (in Croatian). 18 February 2012. Archived from the original on 13 June 2013. Retrieved 11 February 2013. ^ Equality, The Department of Justice and. "Frequently Asked Questions". www.justice.ie. Retrieved 22 March 2018. ^ "Corrosive and Explosive Substances and Offensive Weapons Act 1958 (Revised 1988)". ^ "Corrosive and Explosive Substances and Offensive Weapons (Amendment) Act 2014". Archived from the original on 2016-08-04. Retrieved 2016-06-01. ^ "Reglamento de Armas" (in Spanish). noticias.juridicas.com. Retrieved 20 August 2012. ^ "Controlled and Prohibited Items Under Police Licensing and Regulatory Department" (PDF). Retrieved 18 Jan 2018. ^ "Knives, offensive weapons and the law". gov.uk. Retrieved 12 December 2018. ^ "Knuckle dusters". www.border.gov.au. Archived from the original on 2017-10-23. Retrieved 22 March 2018. ^ Department of Justice Canada (1998-12-01). "Part 3. Section 15.". Regulations Prescribing Certain Firearms and other Weapons, Components and Parts of Weapons, Accessories, Cartridge Magazines, Ammunition and Projectiles as Prohibited or Restricted (SOR/98-462). Retrieved 2011-11-02. ^ Canada Border Services Agency (2013-01-23). "Part 41 Exception (a).". D19-13-2 Importing and Exporting Firearms, Weapons and Devices. Retrieved 2016-01-22. ^ Pocket Oxford-Hachette French Dictionary. Oxford: Oxford University Press. 2005. ISBN 978-0-19-861071-7. ^ "Zakon o oružju i municiji". www.paragraf.rs (in Croatian). Retrieved 2016-12-11. ^ "14,000 Brass Knuckles Found Disguised As Belt Buckles". Local 6 News. WKMG-TV. 10 April 2006. Archived from the original on September 27, 2008. Retrieved 8 November 2008. ^ ABC News: "New Undetectable Weapon Could Slip By Security At Airports This Summer"
^ "New York Penal Law sections 265.00 and 265.01". Retrieved 4 March 2013. This page was last edited on 23 March 2019, at 15:22 (UTC).